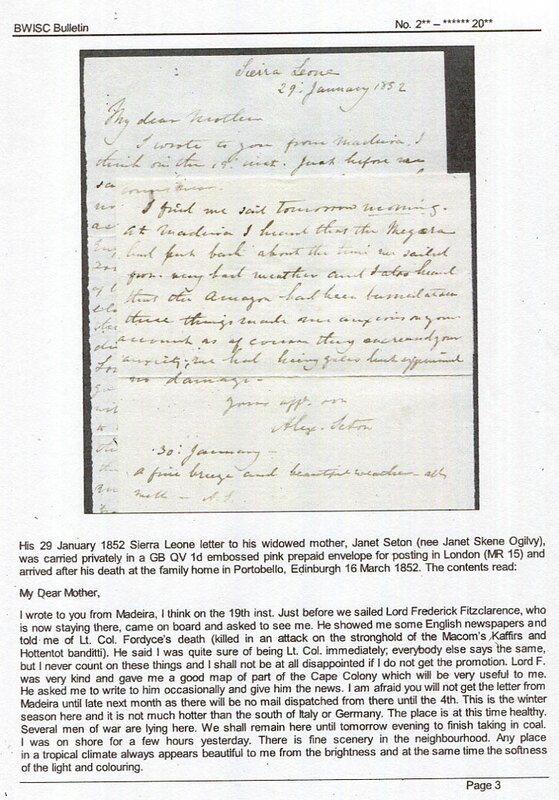 QV covers (early) QV covers (late) R.A.F. 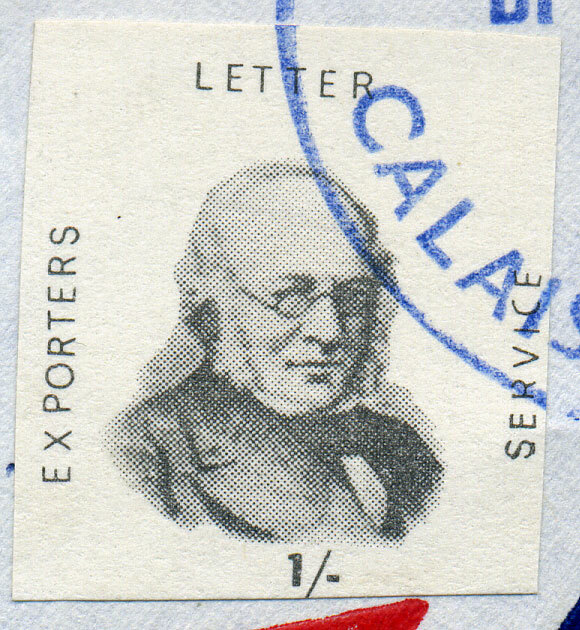 R.L.O. 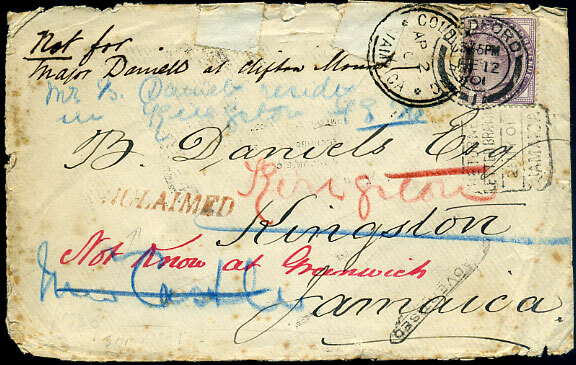 1905 use of GB 1d carmine/buff Post Card pmk'd Derby JA 5 05 arriving Kingston, Jamaica JA 28 05 with 1d Arms pmk'd Kingston FE 17 05 arriving Georgetown, Br. 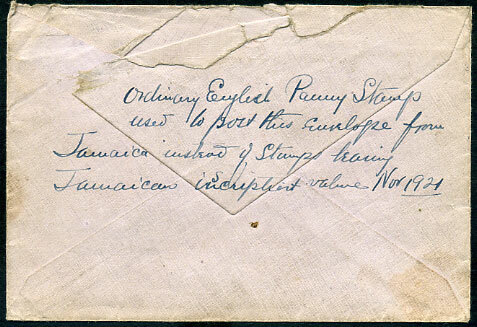 Guiana 1 MAR 1905 with 2c pmk'd Georgetown 4 MAR 1905 showing Port Of Spain, Trinidad MR 6 05 and New York MAR 23 1905 transits before journey abruptly ended with San Francisco P.O./APR 14 1905/D.L. 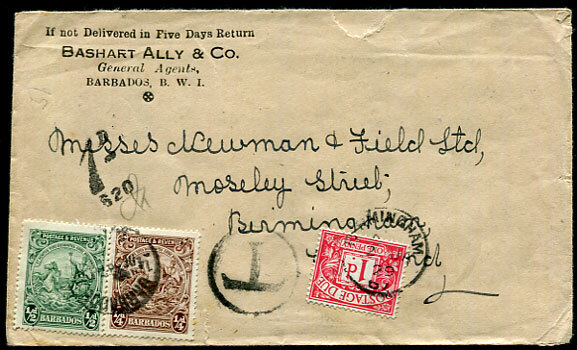 SECTION (Dead Letter) purple d/ring, alongside further purplish boxed handstamp with lower line reading "Returned from R.L.O." 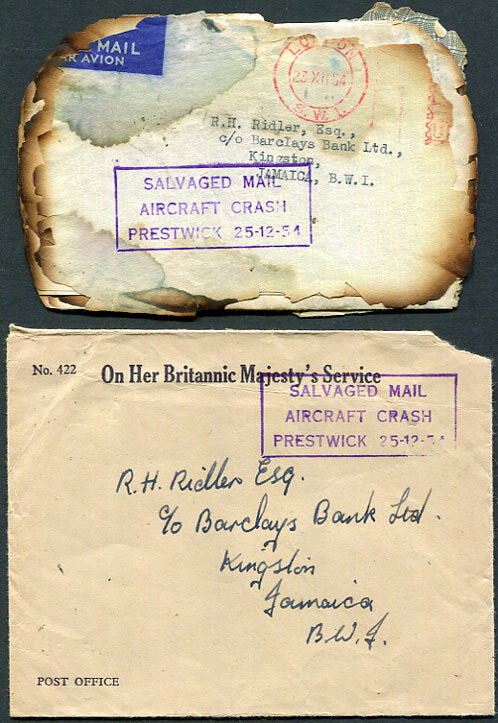 (town unclear) with black manuscript "Contrary to Regulations", corner damage but "around the world" entires rarely found incorporating the British West Indies. 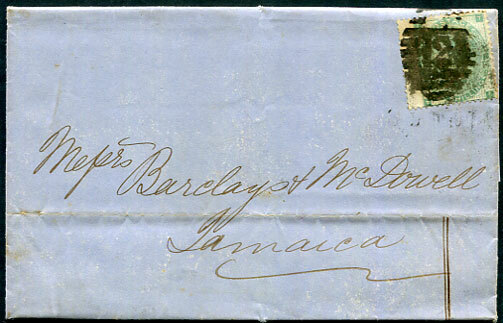 1863 entire written and postmarked London AP 1 63 with heavily cancelled GB QV 1/- green tied barred oval "12" to Messrs Barclay & McDowell, Jamaica backstamped Kingston-Jamaica AP 20 63 arrival. 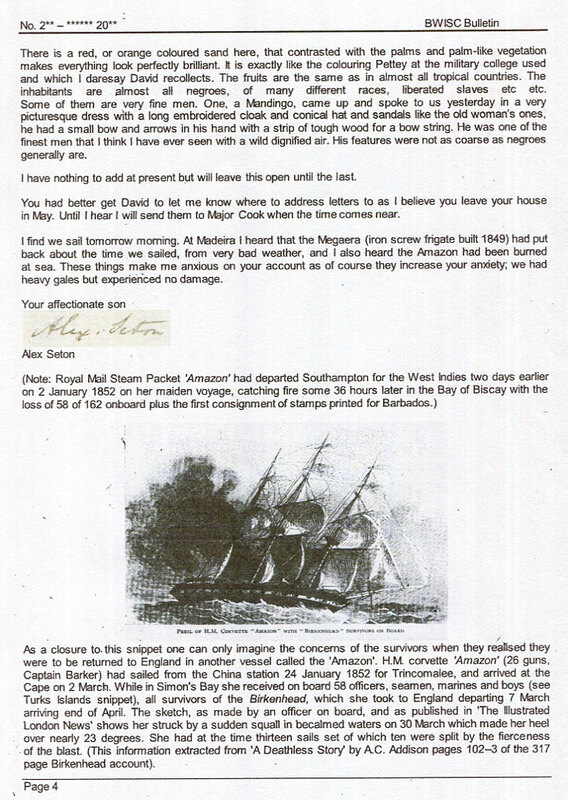 New rates were set from London and the rate to the British West Indies was increased from 6d to 1/- per half ounce on AP 1 1863, RMSP "La Plata" departed from Southampton AP 2 1863. 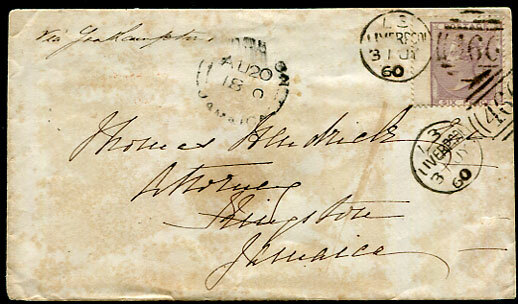 1860 GB QV 6d cover to Thomas Hendrick, Attorney, Kingston, Jamaica pmk'd LIVERPOOL "466" duplex dated 31 JY 60 showing both KINGSTON AU 20 1860 dbl-arc arrival and manuscript "1" for the allowed 1d on the half ounce, overall damp toning. 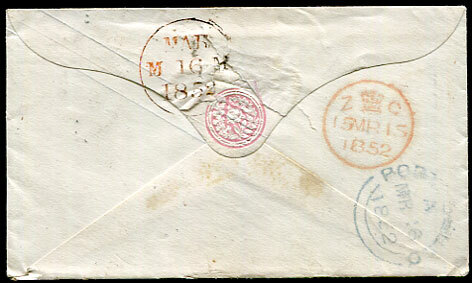 An Act of JU 14 1860 authorised the Colony to retain 1d on the half ounce mail. 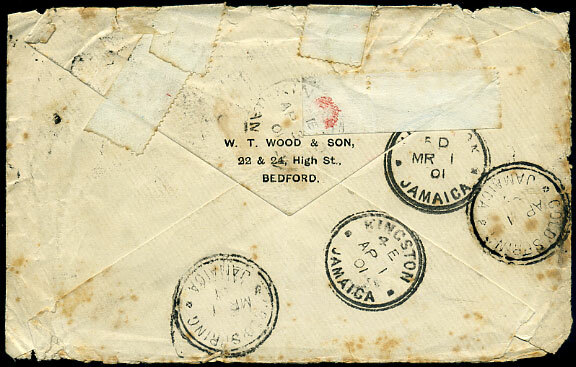 On AU 1 1860 Jamaica took control of her own Post Office. 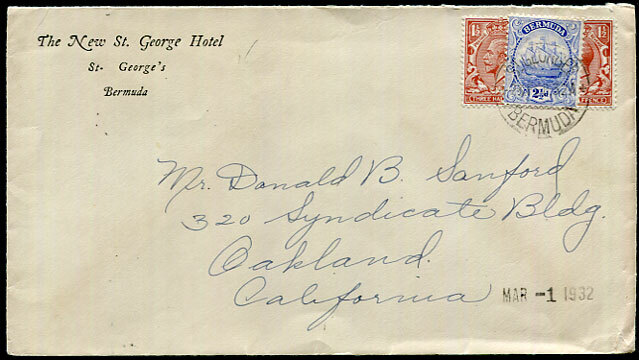 1932 cover from confused tourists staying at The New St. George Hotel, St. George's, Bermuda addressed Oakland, California with Bermuda 2½d Caravel placed over pair Great Britain KGV 1½d tied ST. GEORGES 23 FEB 32 cds. 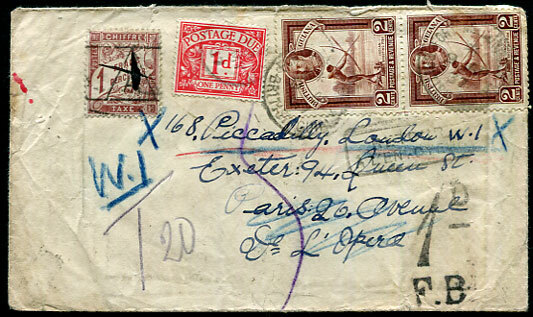 1937 (AP 9) KGV 2c pair underpaid franking from Georgetown most unusually addressed by the sender to three locations arriving Paris (AP 28) with 1fr due added and re-directed MY 10 to London (MY 13) with GB 1d due tied MY 15 37, various tax marks, return to sender, unknown additions as expected for a cover attracting postage dues in two differing countries. 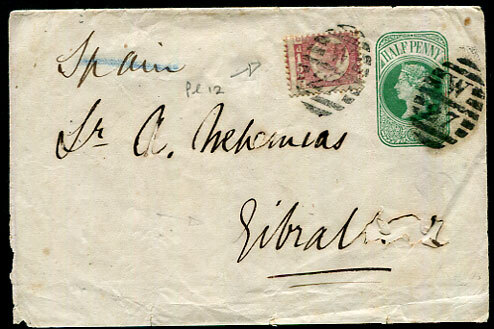 Probably used 1875 undated GB QV ½d green newswrapper with added bantam QV ½d Plate 12 pmk'd W/27 oval obliterator to Gibraltar, some faults. 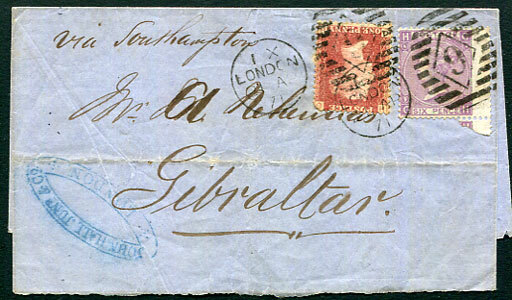 1871 wrapper with sender's cachet to Gibraltar with Great Britain QV 6d (postage) and QV 1d (late fee) twice pmk'd London IX/21 AP 71 "9" duplex. 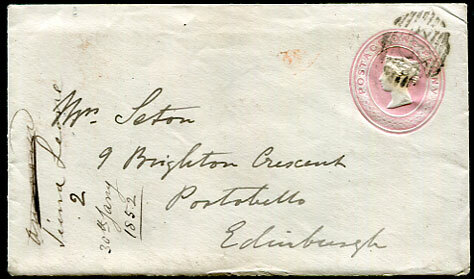 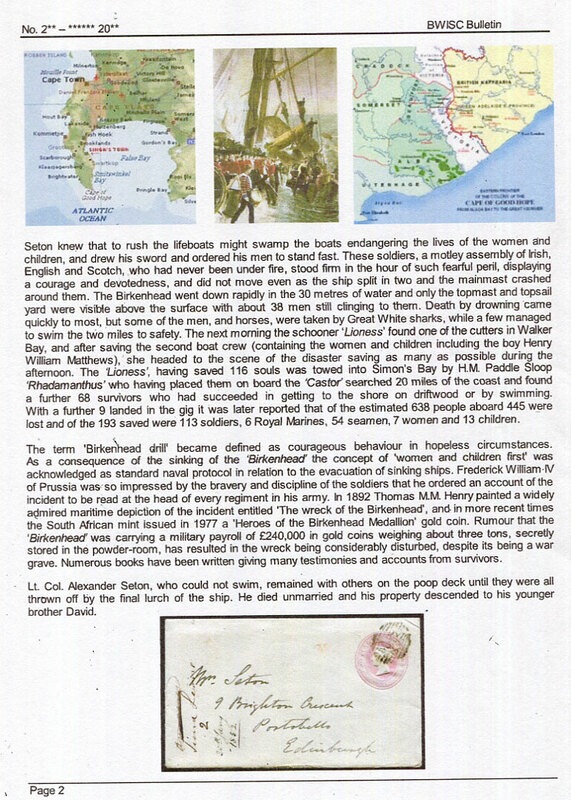 1852 letter from Lt-Colonel Alexander Seton written at Sierra Leone 29th January posted in GB QV 1d pink PSE to Edinburgh with MR 15 and MR 15 transit and arrival backstamps. 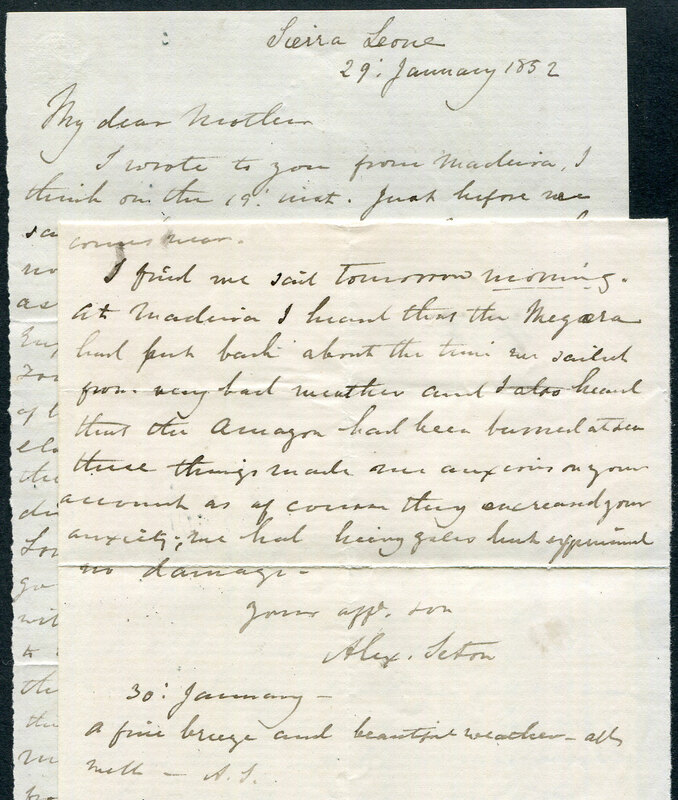 This is the only letter he wrote from Sierra Leone and the penultimate letter before the tragic disaster in Simon's Bay in the early hours of 26th February 1852 which took about 445 lives. 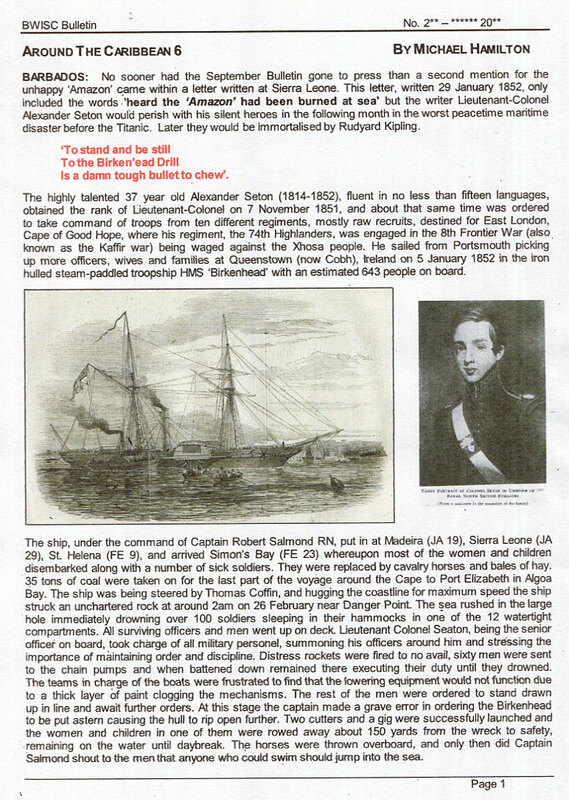 A 4 page account of the disaster accompanies as prepared for the December 2018 British West Indies Study Circle journal. 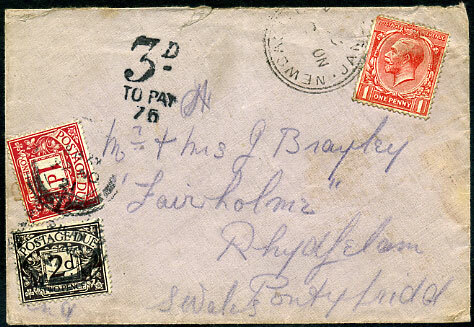 1928 shortpaid cover from Bashart Ally & Co to Birmingham with ¼d, ½d Badge tied 14 DE 28 with circled "T" and GB 1d Postage Due tied Birmingham 2 JA 29 cds, small opening fault middle top. 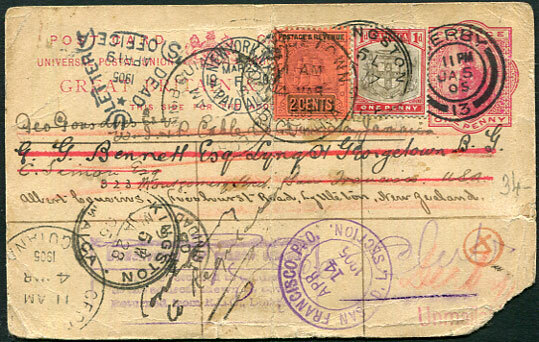 1931 cover with GB KGV 1½d tied Glasgow machine dated 3 SEP 1931 to "BAMENDA, B.W.I." 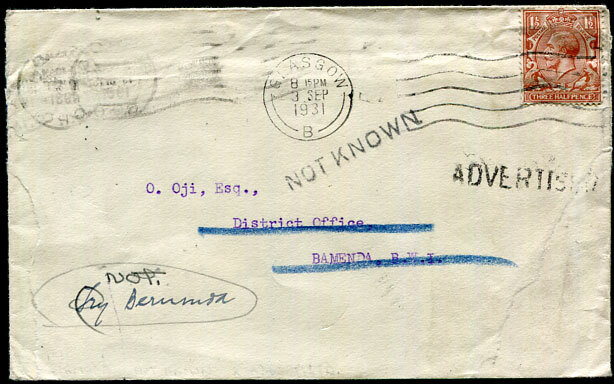 with handstruck "NOT KNOWN" and "ADVERTISED" applied Barbados 19 SEP 1931 (backstamp) with manuscript "Try Bermuda" amended "Not" with "Try" deleted with Hamilton 23 NOV 31 backstamp, originally poorly opened 3 sides but frontal tear at right sealed with tear at left open. 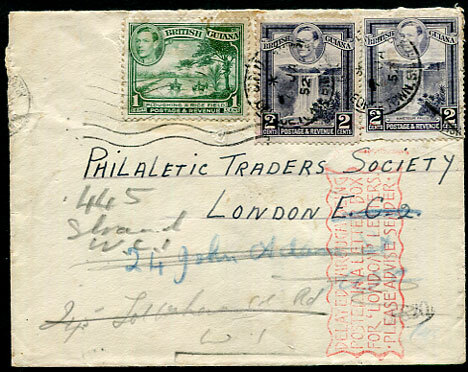 1952 cover with KG6 1c, 2 x 2c pmk'd Georgetown */7 JA 52 to the Philaletic (sic) Traders Society, London with 24 John Adams Street address added, re-directed Tottenham Court Road, and finally directed to The Strand, rare use of red handstamp "DELAYED THROUGH BEING/POSTED IN A LETTER BOX/FOR 'LONDON' LETTERS./PLEASE ADVISE SENDER" added in London, backstamped London FE 18, and FE 19 (twice) cancels. 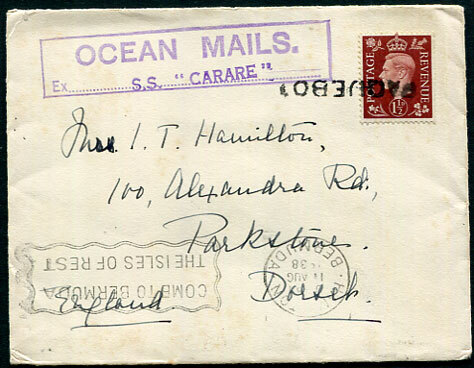 1938 (JA 1) foolscap cover from David Tucker, Parliament Chambers, Hamilton (printed flap) to Aberdeen with KG6 franking pmk'd Hamilton, tax handstamps with GB 1d, 5d, 1/- Postage Dues added and tied on arrival, central fold. 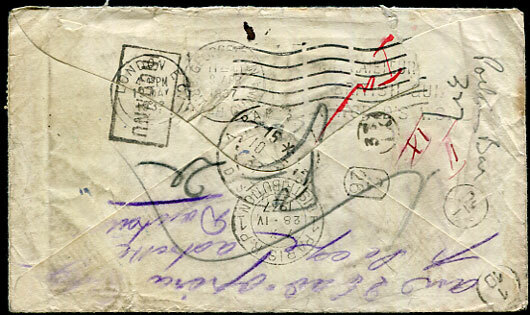 1943 (AP 7) foolscap cover to Capt. 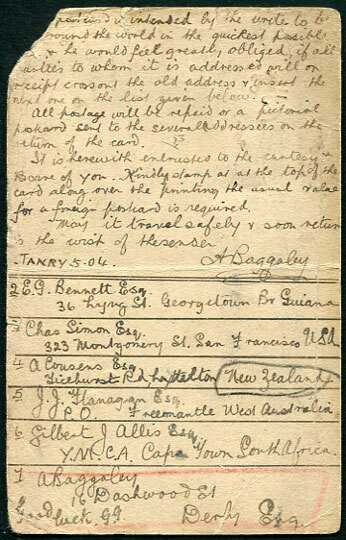 J. Parr, Army & Navy Club, London with KG6 franking pmk'd Hamilton, tax duplex 420 centimes with GB 1/-, 2/6d Postage Dues added and tied on arrival. 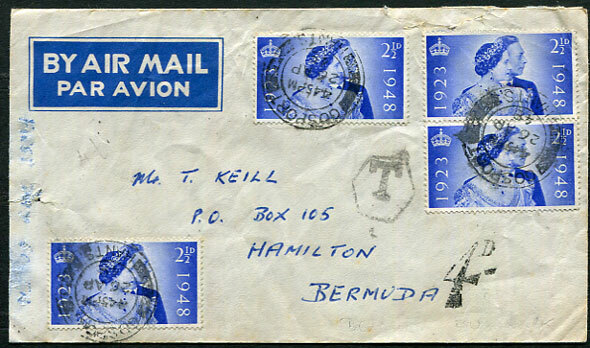 1948 (AP 28) cover with pair, two singles Great Britain KG6 2½d Royal Silver Wedding pmk'd Gosport, Hants to Hamilton, tax handstamp and handstruck "4d" due on arrival. 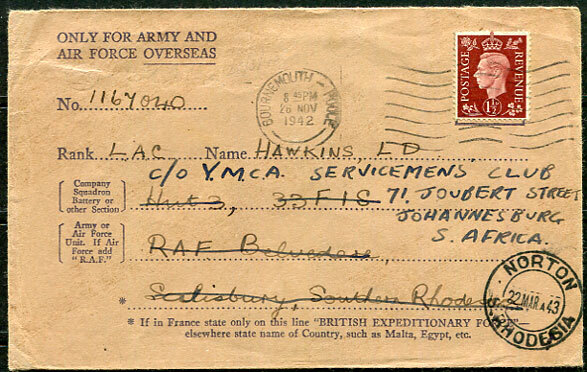 1942 "ONLY FOR ARMY AND/AIR FORCE OVERSEAS" envelope for use to servicemen overseas addressed RAF Belvedere, Salisbury, Southern Rhodesia with GB KG6 1½d pmk'd BOURNEMOUTH-POOLE 26 NOV 1942 with strong NORTON 22 MAR 43 and forwarding to Johannesburg, South Africa (purple str. 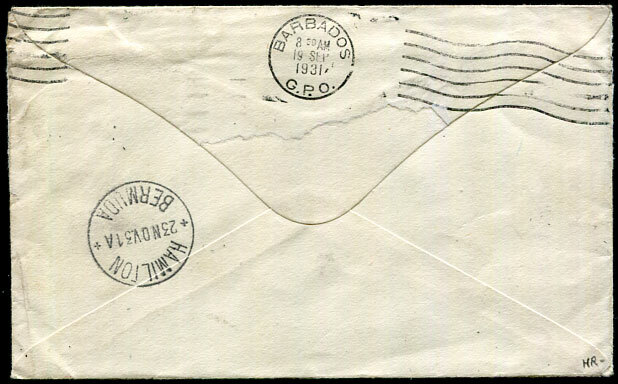 line 26 MAR 1943 dater on reverse). 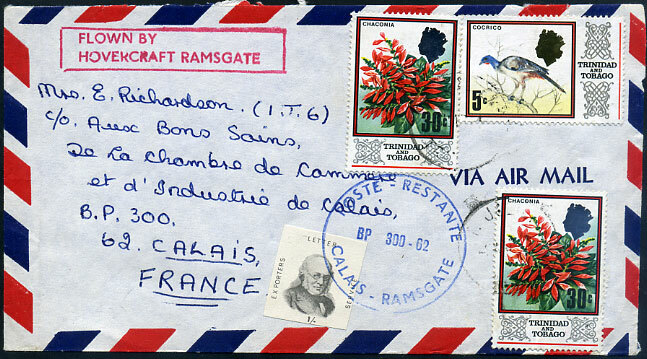 1975 cover to Calais, France with QE2 5c, 30c x 2 pmk'd 9 MAR 74 with red boxed FLOWN BY/HOVERCRAFT RAMSGATE and 1/- EXPORTERS LETTER SERVICE label depicting Sir Rowland Hill tied blue POSTE - RESTANTE/BP 300-62/CALAIS - RAMSGATE cachet.